As a result of Ernest Richard Shotton’s extensive working life I have taken the decision to write about his life and Labour twice. My second post on the working life of E.R.S will look at his career in the latter part of his life. 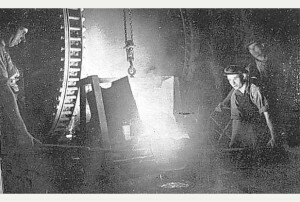 Birmingham was known for metal industry. For most of his life Shotton had been very lucky in that trade was always on his side. However, during the First World War his business suffered and he felt the brunt of this. This was because “all [the] countries [who] engaged in the war were now bankrupt” (Shotton. E, 33.) During this period of time Shotton also was taken ill with a burst appendix and was unable to work for a few months. Due to him being a senior member of this business, this led to problems within his business. Shotton Bros, Halesowen, West Midlands. 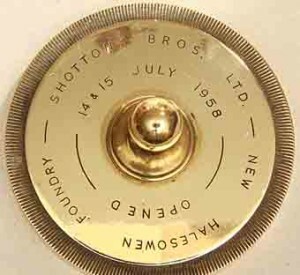 Brass Paperweight made by Shotton Bros Foundry for their opening on July 1958.
labour trouble.” After explaining all of this in great detail, he then explores the financial difficulty this led to. During the war the government made “credit easy with banks,” meaning lending money was rather easy for the business. However after the war, the government were short of money and therefore pressed for payment. As a result of this, Shotton Bros LTD were taken to court by the bank demanding repayment of their overdraft. However it was after this point that business for Ernest started to pick up. Shotton includes in his memoir how he considers it important that he truthfully examines all the parts of his life and that he “is not ashamed of the standard of living and comparative poverty from which [he] sprang” (Shotton. E, 36.) This is him acknowledging that he has struggled for some part of his working life but continued to strive to do better. In this he never forgot where he came from and never appeared above his station.